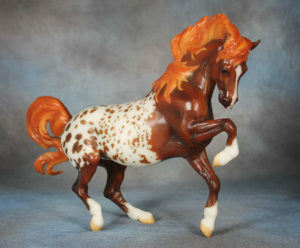 Home » Model Horse	» BreyerFest Auction Lot #5 Is The Connemara Mare With Super Flair! BreyerFest Auction Lot #5 Is The Connemara Mare With Super Flair! Breyer posted a sneak peak of the fifth BreyerFest 2016 Auction lot on the Breyer News Page. Next up, is Lot #5! She is a Liver Chestnut Blanket Appaloosa Connemara Mare on Mold No.732. It’s no secret that Sarah is one of my very favorite sculptors and she is also the sculptor of this year’s BreyerFest Celebration Horse Imperador das Aguas JM! I do still have a few Imperadors for presale and they will ship out from me in less than 30 days, straight from Kentucky! Yikes BreyerFest is approaching quickly! They are priced at $65 which includes free Priority Mail Postage. International shipping is available for $15 additional. The BreyerFest 2016 Crystal is The Girl From Ipanema. I blogged about her earlier and you can see the original post below. If you are a fan of the Connemara Mare mold I do have a variety of them for sale that are also listed in this post. BreyerFest The Girl From Ipanema & Connemara Mares! 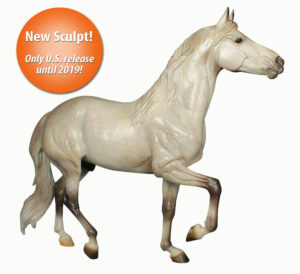 « BreyerFest Auction Lot #6 Is Man O’ War With Brilliant Decor!